The CM3-Home schematic is made by 14 sheets. This so high division is required because it is a quite complex circuit and, furthermore, to ease the comprehension and reuse of each single module. 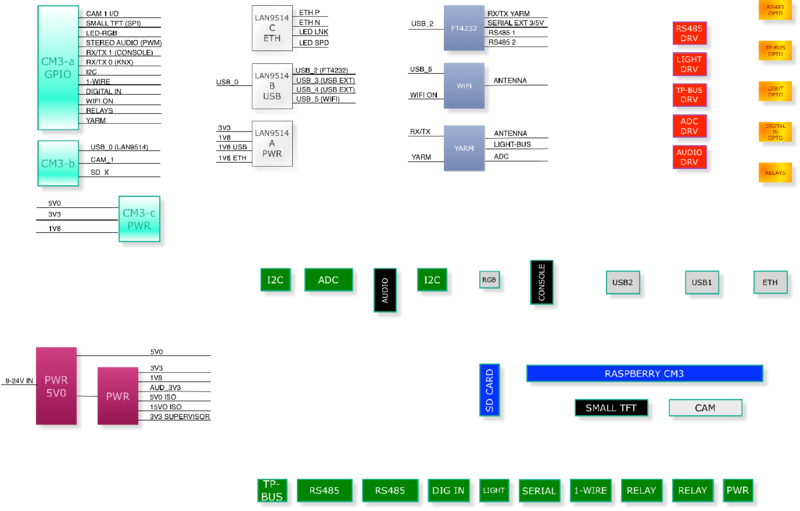 Starting from the block diagram below, let’s proceed with a quick description of the schematic diagram. The Raspberry PI Compute Module 3 component is split in A, B, C blocks. B block is related to the very specific, non re-mappable peripherals like USB, SD card, Cam, HDMI, etc. The B block and the devices directly attached to it are shown in the main sheet (CM3-Home file, no suffix). C block is depicted in the CM3-Home_PWR sheet, together with other circuit’s power supplies. A block is in the CM3-Home_IO sheet, with the list of all the re-mappable GPIOs and a brief descriptions of the attachable peripherals. The LAN9514 device is driven by the only USB port available on CM3 and creates 4 different USB ports plus a 10/100 Mbps ethernet port. The LAN9514 component is split in three blocks as well. A and B blocks, related to power supplies and to USB ports, are depicted in the CM3-Home_USB sheet. C block is on the CM3-Home_Ethernet sheet together with protections and the RJ45 socket. Another, quite complex, device is the FT4232. It is driven by one of the USB ports available from the LAN9514 and creates 4 different serial ports. Those are shown in the CM3-Home_Serial sheet. Two of them are configured as RS485 ports, one to connect the YARM module and the fourth one as a generic TTL serial port exposed on the external socket. The debug serial port is directly available from the CM3 miniuart peripheral. The CM3 full serial peripheral is used to connect the TPUART device. The TPUART is on the CM3-Home_KNX sheet related to KNX bus. The CM3-Home_1-2-Wire sheet contains the 1-wire and 2-wire interfaces components (AKA TWI and I2C). The DALI bus is on the CM3-Home_DALI sheet. The RX and TX lines are bit-banging driven on two GPIOs. Exchanging the two 0Ω resistors you can choose to use the CM3 or the YARM’s CPU to write or read the DALI signals. In the CM3-Home_REL sheet there are the relays and the driving circuits connected to two GPIO. In the CM3-Home_ANALOG-IN sheet there is the schematic with protections for the analog inputs designed to connect anti-tamper balanced line but usable in other ways as well. The analog inputs are connected to the [YARM peripherals because the Raspberry PI CM3 has no analog inputs. 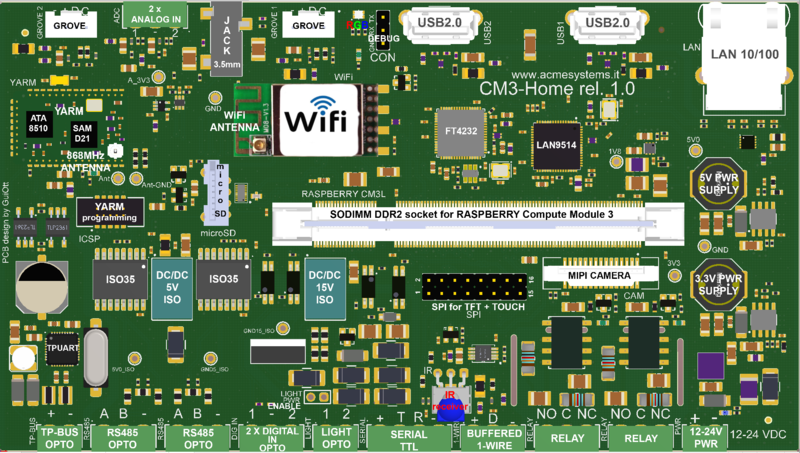 The CM3-Home_YARM and CM3-Home_WiFi sheets are related to those interfaces. The CM3-Home_Audio sheet contains the audio circuits, compatible with the Raspberry PI3 board. In short, to obtain a decent quality audio output, we are using the two PWM peripherals available for the left and right channels, a digital buffer to decrease the output impedance and a low pass filter.